Department of Agriculture Secretary Manny Piñol reports the fury that President Rodrigo Roa Duterte was in after hearing the extortion activities in Aritao, Nueva Vizcaya, that may quite possibly amount to millions, from no other than the Land Transportation Office (LTO) personnel which were assigned in Artitao to weight overloaded trucks. 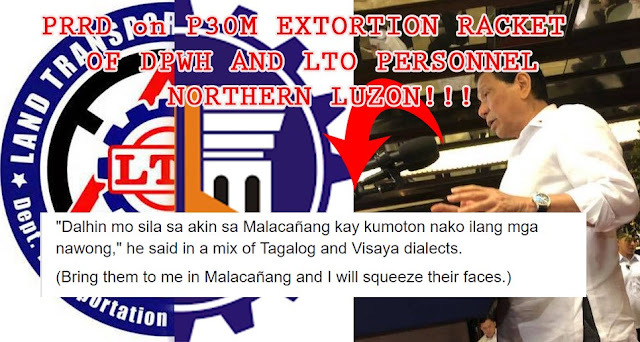 Duterte ordered his special assistant, Bong Go to contact the LTO Secretary and Department of Public Works and Highways (DPWH) Secretary to relieve their men stationed in Aritao who were working side by side in extorting truck drivers as much as a 1000 pesos per truck. Rice traders informed Duterte that nowhere-righteous extortion has been going on for decades and not even the previous administrations have been doing anything about it. A thousand trucks may pass the weighing scale on a good day, and the extortion payment to avoid “inconvenience” would amount from 500-1000 pesos per truck. This all amounts to up to 30-million pesos every month! "Dalhin mo sila sa akin sa Malacañang kay kumoton nako ilang mga nawong!" The rice traders also informed Duterte that the said personnel have been incredibly working hard for their modus-operandi, they’ve been known to continue extorting even when on vacation, personnel filled with such devotion! This is also why Duterte acted so quickly, he asked Go to call LTO Secretary Art Tugade despite undergoing a medical checkup. "Art, pasensya ka na istorbohin muna kita pero kailangan mo i-relieve yong mga LTO mo sa Aritao, Nueva Vizcaya. Pagkatapos dahil mo sila sa akin sa Malacañang kay kumoton nako ilang mga nawong." This extortion activities may seem minimal considering how one sack of rice can compensate for a truckload’s worth of extortion, but the illegal activity has been putting a strain on the rice market for it forces the rice traders to increase their prices in order to compensate for the loss.